When it comes to video slots based on chart-topping '80s ska-pop giants, it's probably fair to say that slot developer Ash Gaming have carved themselves a pretty fine niche. And that niche is pretty well filled with their Madness House of Fun slot, a 5-reel, 25-payline game that should satisfy the nuttiest Nutty Boys fans around. Not only does it feature video clips from the band's classic tunes, plus a choice of Madness tracks to play in the background, but the bonus features are pretty monster too. Oh, and to top it all off, there's even a Progressive Jackpot! There are three tunes to listen to while you play. Choose 'The Business' while you spin, or let the soulful strains of 'The Return of the Los Palmas 7' wash over you. And that's before you even get to the bonus features. On the reels, there are plenty of Madness images from the band's iconic pop videos to accompany your game: a bowler hat, a London double decker bus, a saxophone, together with some jolly-looking 10-through-Ace symbols. The Madness logo is the game's Wild and substitutes for all symbols other than the game's many Scatters and bonus symbols. Five Wilds bags you the jackpot of 10,000 coins. So, where do you begin with the Scatters? First up is the Vinyl Record Scatter. 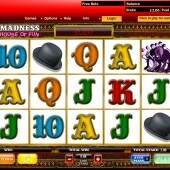 Three of those on Reels 1, 3 and 5 activates the free spins bonus round. This is no ordinary free spins round, however: here you get to choose from five different free spins modes, each one carrying a different number of free spins and different reel modifier, as well a Madness hit to go with it. You will also notice every mode has a category – ‘Steady’, ‘Balanced’ or ‘Adventurous’. For example, Our House is one of the 'Adventurous' picks and can bag you up to 20 free spins. 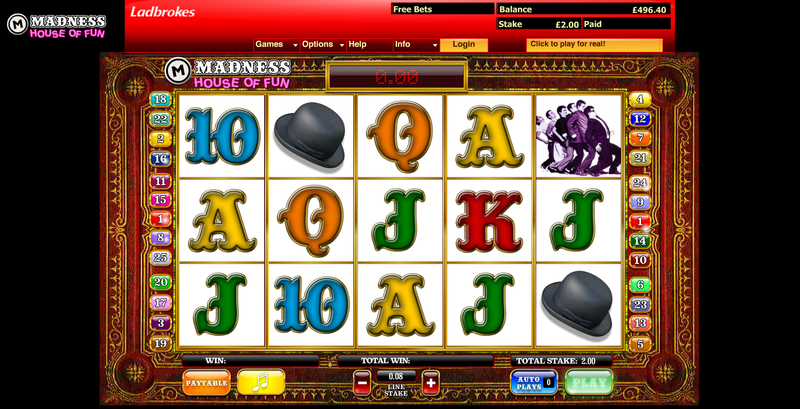 Look out for the Our House symbol on the middle reel as it can award between 1 and 5 extra free spins. Baggy Trousers, meanwhile, can win you up to 10 free spins. Madness member Thommo may crop up too to turn random symbols into Sticky Wilds. The helter-skelter symbol, taken from the classic No. 1 single of the band's, House of Fun triggers a fun bonus when you land three symbols on Reels 1, 3 and 5. A typical 'Pick 'em' game, you are transported to the House of Fun and have to choose prizes to win cash prizes. Keep picking until you hit the 'Collect' sign and are sent tumbling back to the base game. Last but not least, the Lucky Seven bonus round can be hit simply by hitting the Lucky Seven symbol on the third reel - easier said than done. The dice total is multiplied by your total stake to define your win. If your total is the (lucky) 7, your win will be multiplied by seven and you get to throw again. What's best about this round is that it can be re-triggered up to an incredible 40 times. So, there's plenty for fans of online slots, as well as the band, to enjoy here. But Ash Gaming aren't finished there; they've thrown in a progressive jackpot too! Hit gold dice on Reel 3 instead of the red dice in the Lucky Seven bonus round and you'll bag the game's biggest jackpot! With some great features and music, Ash have gone to town with this exclusive band tie-in. Music slots fans should lap it up, but there's plenty more to enjoy out there. Rival Gaming's nostalgia-themed slot, So 80s, is great for anyone who remembers the decade of Boy George, Live Aid and bleached denim, while iSoftBet's '80s Night Life is an equally light-hearted slot with a similar pop theme.